Upon arriving at Omni Airport Parking, drive under the covered entrance. An attendant will approach you, give you a parking claim check, and inspect your vehicle. Their team will valet your vehicle! Please show your prepaid email receipt from SimpleAirportParking.com to parking attendant. Shuttles run every 15 minutes to and from the MCO airport terminals. After retrieving your luggage, go to Ground Floor - slot A12 or B12 - depending upon which terminal you are in. If necessary, call 888-538-3598. 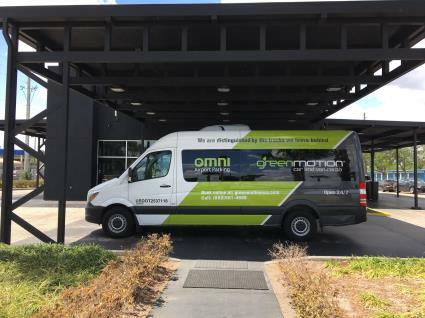 Omni Airport Parking Orlando offers customers extremely low daily rates, a CCTV-monitored, paved parking lot, and 24/7 access with free shuttle service.